Looks like we will have the opportunity again this Spring. Several of us had a wonderful time a couple years ago camping and seining and contributing with fishy fellowship. The weather should be ideal in late April, Spring will be in the air and the water comfortable enough to snorkel while wearing a wet suit. We compiled an article that was in a recent issue of American Currents. I'm not sure which issue? From a search on the internet i could not find a date for the 2018 Darter Festival. It would be nice if they sync again. In 2018 i would like to see fish pedaling bicycles. Attached is Turkey Creek Charles' invite and flyer but we should work together as a NANFA team and coordinate our activities. Post here if interested to coordinate. 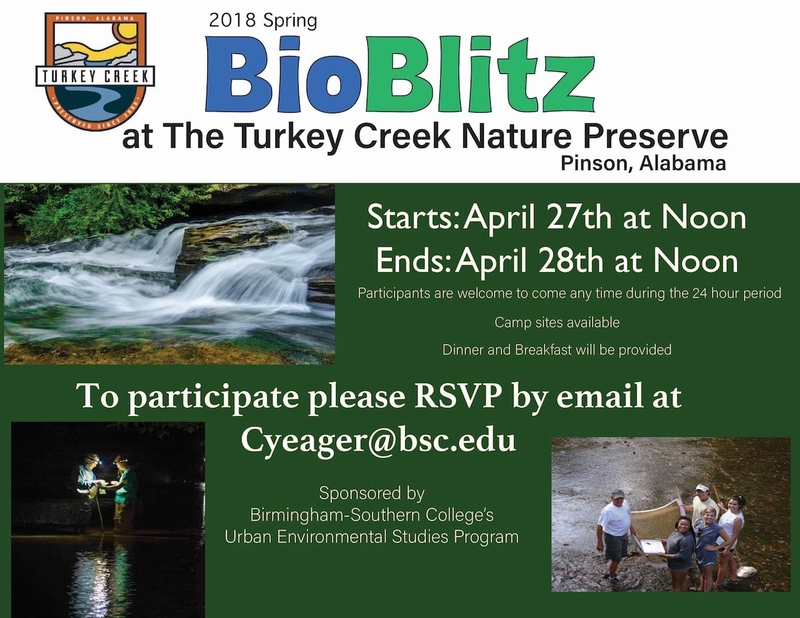 We are very excited to announce the return of the spring BioBlitz at the Turkey Creek Nature Preserve! This year's event will begin this year on April 27th at noon and continue through noon on April 28th. This will be the 6th time we have hosted a BioBlitz, and every time we discover many new things that have a huge impact on our understanding of our unique habitats. In fact, these events have lead to the documentation of four new protected species in the area, which has resulted in numerous research and restoration projects. So, not only is this a fun event, but it also has a direct impact on future stewardship efforts! For those of you not familiar, a BioBlitz is a 24-hour event in which teams of volunteer scientists, families, students, teachers, and other community members work together to find and identify as many species of plants, animals, microbes, fungi, and other organisms as possible. This is a fun and exciting opportunity to come together as a community and share our knowledge and hopefully learn a little along the way. Participants are welcome to come and stay as long as they would like during the 24-hour period. We will have space for camping, and will provide dinner on the night 27th and breakfast on the 28th. This event is always very fluid, with people coming and going throughout the event, therefore there will not be a strict schedule of when groups will be going out for any particular outing. We will be sure to have someone to meet all participants at the front gate and let them know what is happening when they arrive. Closer to the date, I will send an email out to anyone who has RSVP's with more details concerning the schedule and logistics. Yeah, I can finally meet up with Martin and give him back his net. Birmingham's Darter Festival will be held on April 15th, a Sunday. So unfortunately it will NOT sync with the BioBlitz. There had been talk about building a pavilion providing better bathrooms and power for battery charging... but still not yet. Maybe this Fall. Thus it will again be primitive camping with portajohns. Nonetheless it will be a lot of fun as it was a couple years ago. April 27 and 28. I would plan on camping both nights and heading home midday Sunday. Mist netting for bats? Such a super cool addition. I went the last time and it was a great event! I would love to see NANFA volunteer and host/sponsor/lead the fish survey part (which is ind of unofficially did when we were there last time). But this time if we volunteer in advance we might be able to get our name out there. I really hope that we can do this as an organization... this is right up our alley. Unfortunately I will not be available that weekend. I'll contact Chuck at the Preserve and tell him we're coming as a NANFA group, somewhere between 3 and 20 people, but we'll be there. I'm planning to be there Fri. afternoon/evening thru Sun. Hoping this works out. There was some question because my truck is not reliable over long distance. That question was settled when, at 540,000 miles, the engine seized up. So now I have a new ride. Now all I need is for the work schedule to gel. I'm hoping Stott makes it, we had talked about noodling around on guitar and stuff, but we'll see. I'm hoping Stott makes it, we had talked about noodling around on guitar and stuff such as catfish, but we'll see. Bernie may help with some of the other stuff. It was good to meet Daniel, Bernie, and assorted other folks. Got to see my first Alabama shiner, Warrior bass, and Rush darter. Didn't see a LOT of fish, and we never did find out where the mist net was. It was supposedly placed somewhere but nobody knew where. Next event is supposed to be this Fall - I am on the mailing list now so I'll be sure to keep the group posted if Casper doesn't beat me to it. I was disappointed that there weren't more NANFA people there, but it was still great fun.